Showing results for tags 'dual line'. Found a nice little place in a nice little town to practice and learn indoor dual line. After an hour of trail and error, I started to get the hang of it. Can't wait to go back again! Here's a video of my progress today. I just felt like sharing. So I just made this... Not the first kite I’ve ever made, but it is the first indoor - framed mostly in .098 carbon, eyeballed the bridle (3 point), flies pretty well in my back yard but I’m looking forward to tuning it after a proper indoor test. I am selling a pair of vintage dual line sport kites. 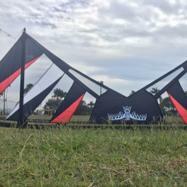 They are a matching pair of custom V-Max kites that Level One developed in the late 90's. One is vented, the other is standard. Both are framed the same and have very little air time on them. Sails show no signs of flight. Frame... Wrapped G-Force leading edges, .230 spine Top Spreader... .230 carbon Bottom Spreader ... tapered wrapped g-force Dimensions.... 7'10" x 40" Sail Depth... 11.5 Wind Range... 3-25 Sail... Ripstop Nylon They are looking for a good home. Selling both for $300 OBO including shipping in the states. PayPal preferred. Thanks for looking. Hello All~ I am selling what I believe is a one of a kind North Shore Radical by TOTL. It is a tie-dye sail that is is beautiful condition. I am honestly not sure how long I have had it in my bag, but it has markings from 1998 as well as a signature by Ron Reich from 2001. I have never flown it myself, and the bridle looks in perfect condition. I am asking $300 OBO. It is a beautiful, rare kite that, as I am aware, is a one of a kind. Please let me know if you are interested. I can email pics, the photos are too large to upload. Prism Nexus 5 Stack RTF SOLD! This is going back in the bag. Thanks for looking. I am selling my home-built Monster std. in order to fund other toys. This is a great kite designed by Christian Derefat and built by me. It is built to the designers original specifications:Leading edge: 6mm pultruded (one piece)Upper Spreader: 6mm pultrudedSpine: 6mm pultrudedLower spreader: Skyshark 5pt black diamond Sail: Icarex and Mylar with Icarex pinstripes. LE is Dacron. APA fittings with RSky Center-T. Nose is Bisonyl.And yes, that is polyester florescent yellow contrasting thread!It has the Derefat feel that some of his other designs have. Very tricky, great jacobs ladders and super pitchy. This kite is a real looker. The only build flaw is that my machine dropped the pointed-part of three stitches in two of the pinstripes--only noticeable if you look for them. Look hard in the last picture.No holes, tears, or any heavy wear; the kite is over all in really good shape. I have been home building like crazy and have more kites than I can fly.Asking $190 plus shipping (keep in mind the one piece LEs may make shipping a few dollars more than normal--not sure about this though).Please don't hesitate to ask questions. I've bought several dual-line kites as of late and need to find a new home for 5 of my kites. I hate to sell them, but I just don't have room. All sales will need to be through PayPal without fees. 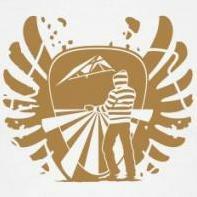 All prices are for the kites only, shipping is additional for CONUS only. Please PM for all communication. When communicating, please be sure to refer to the kite number. These kites come with socks or cases but no lines are included. I've tried to include as much information as I can for each kite, but if you need any additional info, feel free to PM. 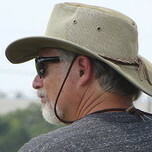 Thanks, Robert 10/28/2015 - Discounted some of the kites. Last time for a discount. If these don't sell, they'll just go back in my bag. Keep in mind that I am willing to do a trade or sell these kites as a package. Just let me know. 11/17/2015 - Thanks.... all kites are back in the bag. OK folks. The next Karma giveaway is a Benson Gemini. 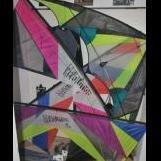 This is a great dual line kite made by a man known for his quality craftsmanship and innovative designs. This kite is very colorful as far as Benson's go. This kite was bought used to try to work on advanced tricks. It is very floaty. Too floaty for my ham fisted inputs and attempts to start learning some advanced tricks. Nor do I have the right winds for this. This would be excellent for those with some access to beach winds. Kite condition is good with maybe some TLC needed. No rips, tears or patches. No roll bars on this model and one of the standoffs is coming loose from the sail. Easily fixable, but it has never prevented me from flying it. Flown over grass only (by me). Comes with original bag. No lines. This kite deserves a home that can set free the tricks in its DNA. A different Gemini, flown by our own RobB on this forum: http://youtu.be/N0NNm0uLBcI The drawing will be on June 1st. Entry will be made by replying here, starting with "I'm in" and entry number will be by order of entry. RNG will be used for the drawing. 1. Amexpmh 2. Brucifer 3. Tim P 4. Sparkie Rob 5. GammoRay 6. 3wrapframe 7. FredVanCuren Standard Karma Note from the Moderators This is a Karma Drawing. The winner of the drawing is expected to pay it forward by offering their own prize for the next drawing. Please do not enter unless you are willing to offer your own prize, preferably not the prize you just won. Drawings should be open for entry approximately 2 weeks, and the next drawing should be posted as soon as possible to keep the Karma rolling. These drawings are run by and for KiteLife members. The moderating team only ensures that your drawing post contains all of the pertinent information (drawing date/time, adequate prize description, drawing rules) before approval. If you are a KiteLife forum member from the US or Canada, you are eligible to enter. You do not have to be a paid subscriber. Members from Canada, Alaska, and Hawaii are welcome to enter the Karma drawings provided they are willing to pay half of the Karma prize shipping cost. The method and timing of the payment will be agreed upon between the two parties after the drawing for a particular prize. Here is the link to the original Rules and Guidelines thread: http://kitelife.com/forum/topic/5426-rules-and-guidelines-please-read/ The mechanism for the drawing itself is entirely at the discretion of the person offering the prize. In the past, entry number has been determined either by order of entry or by the post number in which the member declares entry into the drawing. The drawings have been performed using the RNG method (http://www.random.org/sequences/) or by choosing the numbers out of a hat (I believe an adorable daughter did the picking in that scenario). The only requirement is that the method of selection is clearly spelled out in the drawing post. Entry into the drawings is done by STARTING a post in the drawing thread with the entry phrase chosen by the drawing host (Traditionally "I'm in", but "I LIKE" has been used as well). In order to remove any confusion or misinterpretation, only entries with posts that START with the phrase will be considered. As with all other KiteLife drawings, bantering is encouraged. This is for fun after all. So i have been searching and searching for the right kite. a few months now. no rush as i have a few that i am very happy with! i have been flying a UL and standard Ocius all summer. but its to fast for me. its a great trick kite but to fast and squirely for me i didnt have time to fix over steer and under steer. so i needed a slower kite. and i needed a kite that only did what i told it to do. I finally found it this weekend. A Kymera! wasnt first on my list. i was looking at lots of kites much higher in price but i never even tried one. until this week. i flew Johns for a while and it was great!! he had other kites that i tried as well they were all great. but i needed one that fit me. Its loud and fast when you tell it to be and not when you dont. turns great, goes straight no over or under steer just does what you want and nothing you dont. thats really what i needed something that would just do what i want. Did i find the perfect kite? i dont think that exist but i did find the perfect kite for me so im happy now. i havent felt this feeling since my first flexi foil. so my question for you is: what kite do you love? i want all the juicy details.